The time has come. I bought my second IoT device - in the form of a cheap IP camera. As it was the cheapest among all others, my expectations regarding security was low. But this camera was still able to surprise me. Maybe I will disclose the camera model used in my hack in this blog later, but first I will try to contact someone regarding these issues. Unfortunately, it seems a lot of different cameras have this problem, because they share being developed on the same SDK. Again, my expectations are low on this. I opened the box, and I was greeted with a password of four numeric characters. This is the password for the "admin" user, which can configure the device, watch it's output video, and so on. Most people don't care to change this anyway. 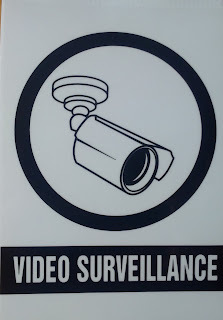 It is obvious that this camera can talk via Ethernet cable or WiFi. Luckily it supports WPA2, but people can configure it for open unprotected WiFi of course. This nice camera communicates to the cloud via UDP. The destination servers are in Hong Kong and China. In case you wonder why an IP camera needs a cloud connection, it is simple. This IP camera has a mobile app for Android and iOS, and via the cloud the users don't have to bother to configure port forwards or dynamic DNS to access the camera. Nice. Let's run a quick nmap on this device. The already known HTTP server, a telnet server via BusyBox, and a port on 8600 (have not checked so far). The 27 page long online manual does not mention any Telnet port. How shall we name this port? A debug port? Or a backdoor port? We will see. I manually tried 3 passwords for the user root, but as those did not work, I moved on. 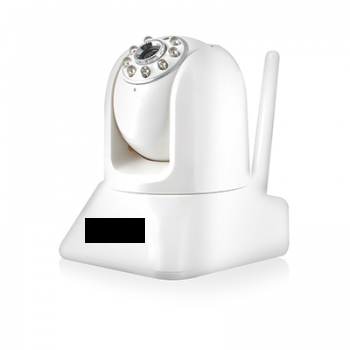 The IP camera can upload photos to a configured FTP server on a scheduled basis. When I configured it, unfortunately it was not working at all, I got invalid username/password on the server. After some debugging, it turned out the problem was that I had a special $ character in the password. And this is where the real journey began. I was sure this was a command injection vulnerability, but not sure how to exploit it. There were multiple problems which made the exploitation harder. I call this vulnerability double blind command injection. The first blind comes from the fact that we cannot see the output of the command, and the second blind comes from the fact that the command was running in a different process than the webserver, thus any time-based injection involving sleeps was not a real solution. but whenever I tried to leak information from /etc/passwd, I failed. I tried $(reboot) which was a pretty bad idea, as it turned the camera into an infinite reboot loop, and the hard reset button on the camera failed to work as well. Fun times. Following are some examples of my desperate trying to get shell access. And this is the time to thank EQ for his help during the hacking session night, and for his great ideas. I also tried commix, as it looked promising on Youtube. Think commix like sqlmap, but for command injection. But this double blind hack was a bit too much for this automated tool unfortunately. But after spending way too much time without progress, I finally found the password to Open Sesame. Whenever a command is put into the FTP password field, it is copied into this script, and after the script is scheduled, it is interpreted by the shell as commands. After this I started to panick that I forgot to save the content of the /etc/passwd file, so how am I going to crack the default telnet password? "Luckily", rebooting the camera restored the original password. Unfortunately there is no need to start good-old John The Ripper for this task, as Google can tell you that this is the hash for the password 123456. It is a bit more secure than a luggage password. It is time to recap what we have. There is an undocumented telnet port on the IP camera, which can be accessed by default with root:123456, there is no GUI to change this password, and changing it via console, it only lasts until the next reboot. I think it is safe to tell this a backdoor. With this console access we can access the password for the FTP server, for the SMTP server (for alerts), the WiFi password (although we probably already have it), access the regular admin interface for the camera, or just modify the camera as we want. In most deployments, luckily this telnet port is behind NAT or firewall, so not accessible from the Internet. But there are always exceptions. Luckily, UPNP does not configure the Telnet port to be open to the Internet, only the camera HTTP port 81. You know, the one protected with the 4 character numeric password by default. Last but not least everything is running as root, which is not surprising. Also, if you want, you can disable the telnet service by commenting out telnetd in /system/init/ipcam.sh. You can use OpenVPN to connect into your home network, and access the web interface of the camera. It works from Android, iOS, and any desktop OS. A quick googling revealed I am not the first finding this telnet backdoor account in IP cameras, although others found it via JTAG firmware dump. And 99% of the people who buy these IP cameras think they will be safe with it. Now I understand the sticker which came with the IP camera. When in the next episode of Mr Robot you see someone logging into an IP camera via telnet with root:123456, you will know, it is the sad reality. If you are interested in generic ways to protect your home against IoT, read my previous blog post on this. Update 20161006: The Mirai source code has been leaked last week, and these are the worst passwords you can have in an IoT device. If your IoT device has a Telnet port open (or SSH), scan for these username/password pairs. Update 2016 10 27: As I already mentioned this at multiple conferences, the cloud protocol is a nightmare. 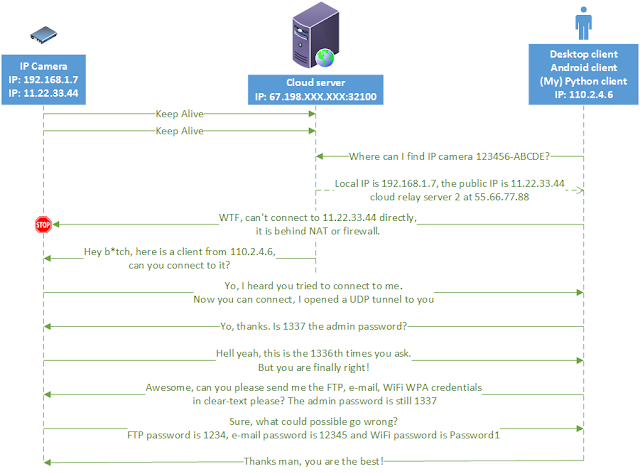 It is clear-text, and even if you disabled port-forward/UPNP on your router, the cloud protocol still allows anyone to connect to the camera, if the attacker knows the (brute-forceable) camera ID. Although this is the user-interface only, but now the attacker can use the command injection to execute code with root privileges. Or just grab the camera configuration, with WiFi, FTP, SMTP passwords included. Update 2017-05-11: CVE-2017-5674 (see above) and my command injection exploit was combined in the Persirai botnet. 120 000 cameras is expected to be infected soon. If you still have a camera like this at home, please consider the following recommendation by Amit Serper "The only way to guarantee that an affected camera is safe from these exploits is to throw it out. Seriously." This issue might be worse than the Mirai worm, because this effects cameras and other IoT behind NAT where UPNP was enabled.